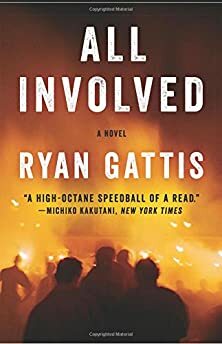 Largehearted Boy: Book Notes - Ryan Gattis "All Involved"
Book Notes - Ryan Gattis "All Involved"
Ryan Gattis's novel All Involved masterfully recounts the Rodney King riots in Los Angeles from a number of perspectives. "An overwhelming and fully immersive performance from Gattis, who finds the humanity and poetry in the most inhumane of circumstances. A solid addition to all fiction collections, though not for the fainthearted." Although he appears throughout the novel, Day 5 is the day Jeremy Rubio (a.k.a. Termite, a.k.a. FREER) gets to tell his story. Restaurant worker by day and graffiti artist by night, he's a loner by nature. His Walkman has been his sidekick, his constant companion, as he stalks the streets looking for walls to paint. "Side 2," as Jeremy says early in his section, "is all rap. Side 1's sound-track songs." And that's what we get in his section, songs from films. His eclectic taste shows his love of wildly different film and TV without saying it flat-out, which I hoped would always subtly undermine any expectation that just because he grew up in South Central Los Angeles, he can only like things that sprang from that environment. On the contrary, he's a streetwise nerd who exalts in being all over the map: Star Wars, Westerns, Sesame Street, and a Bond film all get a check. Because the novel is historical fiction and set during the six days of the L.A. riots in 1992, I found I needed to let my creative decisions be guided by the period (anything on it had to be released before April 29, 1992) and the technological constraints of the time. As such, I loved the idea of doing an audiocassette that was 30 minutes to a side and building something that wouldn't just help build the character but would also score his journey in a unique and meaningful way. We meet Jeremy in front of a house that has been riddled by bullets since he last saw it. The weepy trumpet owns the tone here and the filmic story parallel was too strong for me to resist: that a sinister force (in this case, a rival gang) took Jeremy's co-worker and friend Ernesto away in the same way that the Empire killed Luke's aunt & uncle. Neither Jeremy nor Luke knows exactly what happened to those close to them, but they can be fairly certain how it went down, and each is only left to stare at damaged houses with the knowledge that their worlds have been irrevocably changed. After a tense meeting where Jeremy is told to join the local gang or stop doing graffiti altogether, this comes on as he's walking away and trying to calm down. It's his "strolling music." I conceived of All Involved, in many ways, as a noir Western. The chaos of the 1992 riots essentially made gangland Los Angeles a modern version of the Wild West for six days: a setting for frontier justice and old scores to be settled. Choosing this song was a way to underscore that idea, and, of course, to set up a surprise encounter. Jeremy is facedown in the grass when this comes on. The smoothness of the opening line ("Welcome to your life, there's no turning back") felt raw and perfect when playing for a character in mortal fear for his life, and I had to weave the song into the action. I love how upbeat the song's rhythm feels, but the more I listened to the lyrics, the darker they seemed. The Western theme returns to give the sense that Jeremy's moment of truth has arrived, and a decision must be made. I love Ritter's delivery here, real old school. It's a warble that surely would have plucked on my Texan grandfather's heartstrings. His voice rumbles with a sense of duty and honor that isn't all that different from Jeremy's, who knows he must leave the city, but cannot do so without paying tribute to Ernesto—consequences be damned. This one was a real dig in the stacks, to score Jeremy making a genuinely shocking discovery about the power of the gangs in his neighborhood. Sure, he knew they were bad, but not like this. I could add more, but it'll ruin the surprise, so I'll simply say that a line like "proud of our family, true to the end" still gives me shivers, because it's just dead solid perfect. During his panicked search for something to serve as a proper canvas to create a piece dedicated to Ernesto and the life he lived, Jeremy stumbles onto a sizeable chunk of city property that is crying out to be vandalized. It's so good, in fact, that Jeremy is certain it's a trap. This song comes on right as he decides to risk it. Jeremy's ultimate destination is Phoenix, but only if he can make it safely to the Greyhound bus station in Long Beach. There didn't seem a much better song to fit with the idea that if he makes it out, he'll have to leave everything he knows, and everything he has been to this point, behind. Although it doesn't appear in the book, I planned it out anyway, and found myself listening to it often when writing Jeremy's section. It consists of: "100 Miles and Running" by N.W.A., "Hold Your Own" by Kid Frost, "Violent" by Tupac, "Real Estate" by Cypress Hill, "Steady Mobbing" & "Black Korea" by Ice Cube, and "O.G. Original Gangster" by Ice T.